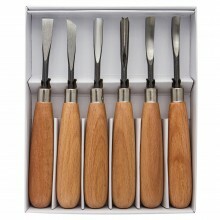 High quality Swiss made carving tools suitable for either lino or wood cutting. Each tool is made from chrome vanadium steel, precisely forged, sharpened and polished for excellent results. Palm-handles are made of hardwood from ecologically managed Swiss forests. Full bolster and square tang for optimal stability. Internal steel ferrule under bolster prevents handle from splitting. Tools are hardened to edge of bevel. Blades electronically hardened to exacting tolerances.